Once upon a time, it was considered rather clever for a cultural critic to remark on how photography and video now matched lived experience as barometers of personal reality: The home movie was as important as the wedding itself; the treasured snapshot was proof the tourist had touched Paris. Today, social media have so thoroughly embedded still and moving imagery into every experience that it’s almost banal to point out that people are too busy taking selfies to savour the moment. The day before The Happy Place opened in Toronto, staff members show off some of the Instagrammable spots. Intended as entertainment that will engage visitors as directly as a playground or a midway, Happy Place is also calculated to engage their phones. 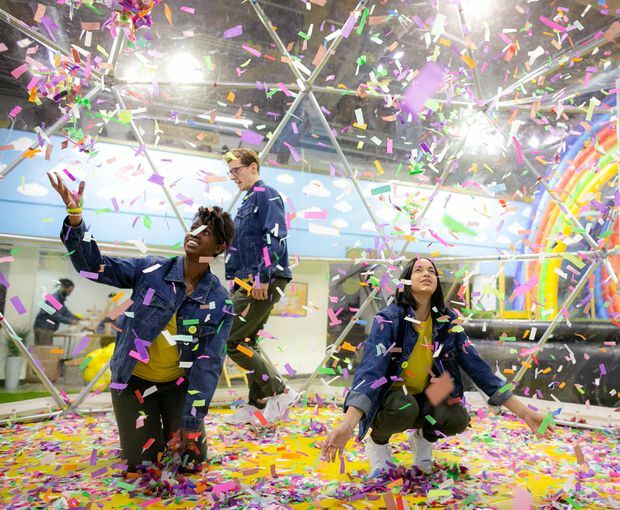 This pop-up interactive exhibition, which hails from Los Angeles and is visiting Toronto’s Harbourfront Centre through January, invites you to stand in a confetti dome where colourful scraps of tissue paper will swirl around your head or dive feet first into a big pot filled with yellow plastic balls. But mainly, it offers you the opportunity to get pictures of yourself in this Romper Room for grownups, and post them on social media. One of the first of the 13 different rooms or installations in Happy Place quickly establishes the parameters of play. It is a darkened space packed with garlands of yellow plastic flowers dangling from the ceiling; the bottom half of the room is filled with a shoulder-high platform that invites visitors to climb short ladders and then emerge through holes into the field of flowers. You pop up through one hole; I’ll pop up through another; you take my picture; I’ll take yours. Meanwhile, several cubicles – one lined with disco mirrors, another with 4,000 rubber ducks – are perfect for shooting Boomerangs, the social-media app that instantly edits your selfie poses into a mini movie. 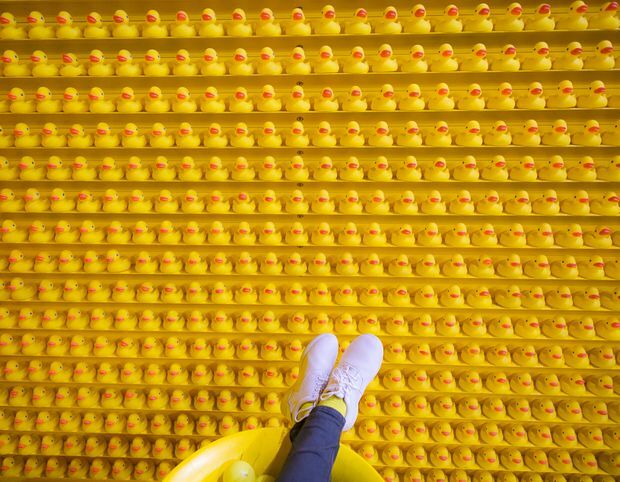 Thousands of rubber ducks line the wall at an Instagram portrait spot in The Happy Place. 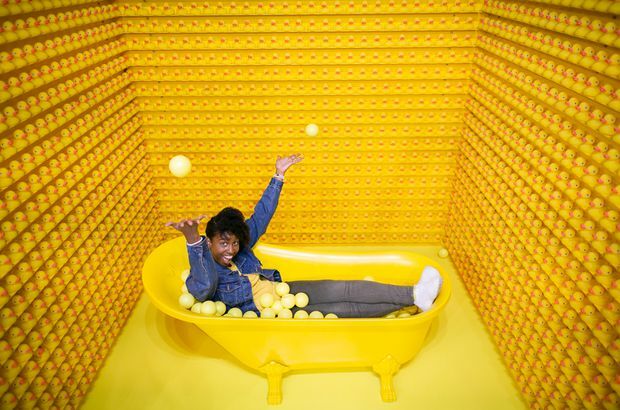 The Happy Place staff member Karlena Waught in the rubber ducky portrait spot. The photo-op approach reaches its apex in the upside-down room where a bed with stuffed animals is attached to a ceiling carpeted in checkered broadloom. The trick is to get a picture of yourself standing on the floor or perhaps clinging to the light fixture placed there, then flip the photo around and, voila, you are defying gravity – along with the thousands of others who are posting #WeAreHappyPlace. Some visitors in L.A. and Chicago, where 200,000 have seen the show already, came ready with prepared poses or costumes suited to the upside-down concept. Exhibitions like the Yayoi Kusama show mounted at the Art Gallery of Ontario last spring have revealed how selfie-friendly installations can turn a serious contemporary art event into a populist blockbuster; meanwhile, Happy Place makes no pretension to be art and instead cuts directly to the social-media chase. At the centre of Happy Place is a giant plastic cookie with chocolate chips that swing open so you can put your head through the hole. The designers of all this fun, brainchild of L.A. live entertainment producer Jared Paul, do prove wittily aware that there’s a certain tension between real and simulated experience, or the thing and its copy. At the centre of Happy Place is a two-metre-high plastic cookie with chocolate chips the size of your head. They swing open so you can pose in the cookie in the same manner that members of a less media-savvy generation used to stick their heads through the holes of fairground cut-outs, visual jokes that date back to the early days of photography. Exit the cookie room (into which the smell of fresh baking is wafted) and you will be greeted by a server offering you miniature cookies. Yes, these ones at least are real. The Happy Place makes no pretension to be art and instead cuts directly to the social-media chase. Happy Place is big on fun food. Its snack bar includes hot chocolate with whipped cream and sprinkles, smiley-face cookies and a grilled cheese sandwich that, when pulled apart slowly, reveals mozzarella that has been (safely) dyed the colours of the rainbow. 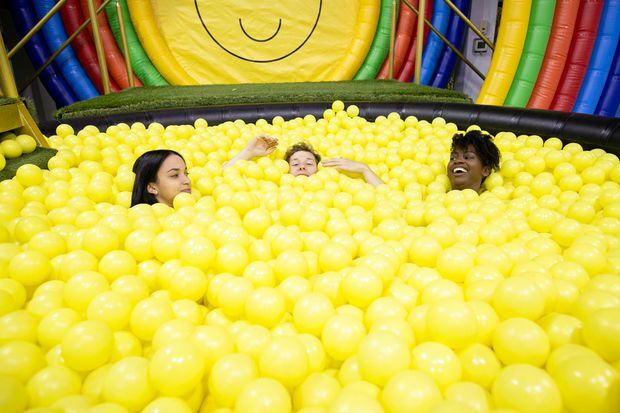 The gleeful nursery menu is typical: Happy Place appeals to the child in adult visitors and anyone who has ever envied the kids bouncing around the ballroom at an Ikea store will appreciate the allure of the pot of yellow balls at the end of a big inflated rainbow. 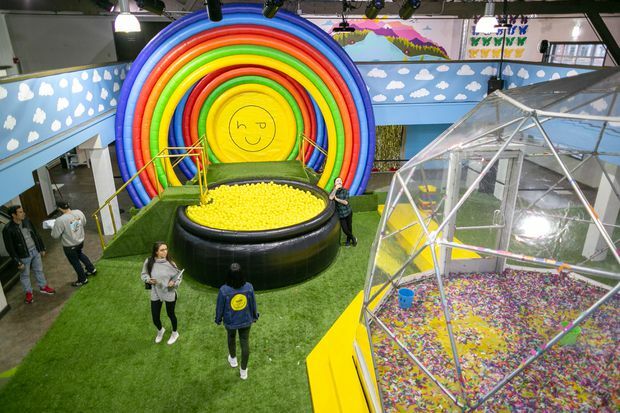 The Happy Place appeals to the child in adult visitors. Yes, an hour-long immersion may prove a brief antidote to the contemporary anxieties that seems to plague youth in particular, but the exhibit is also a reflection of that malaise, an experience that rapidly becomes performative and acquisitive as you chalk up the Instagram hits. Perhaps Happy Place will make you happy; it seems unlikely to make you calm. The Happy Place, Toronto, continues to Jan. 1, 2019.